Coastal Community Grants are an important element of the Municipal Planning Assistance Program’s mission to improve economic conditions by providing technical and financial assistance to Maine municipalities. The Coastal Community Grants are awarded and administered by the Maine Department of Agriculture, Conservation and Forestry Municipal Planning Assistance Program. The Maine Coastal Program, Department of Marine Resources, provides funding through Maine’s federal coastal zone management award from the National Oceanographic and Atmospheric Administration (NOAA). This is a competitive grant program for projects designed to improve water quality, increase adaptation to erosion and flooding, restore coastal habitat, promote sustainable development, and enhance the coastal-dependent economy while preserving coastal natural resources within Maine’s coastal zone. Coastal Community Planning Grant Projects - A listing of grants awarded with their primary issue area, completion date and grant amount. The color coded maps below show awards by location and the project type. Click the thumbnails to view larger maps. 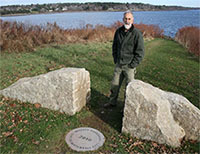 At the conclusion of each project, grant recipients are requested to prepare a case study to describe the project’s approach and results, identify next steps and needs, share lessons learned and applicability for other municipalities and provide recommendations to the MCP for follow-up by state agencies to address identified municipal and regional needs and emerging coastal issues. 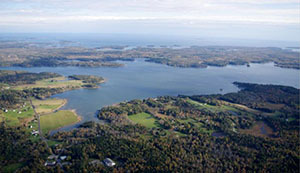 Coastal Community Planning Grant projects are designed to address the goals of the Maine Coastal Program. The case studies appear under the primary goal the project seeks to address.